Home » Nashville Jazz Workshop » A Gem in Germantown: Happy Birthday, NJW! A Gem in Germantown: Happy Birthday, NJW! One of the first spaces we entered (and later chose) had no windows, no walls, no doors, and no electricity. Frankly, it was a mess. But as soon as I walked in, I knew in my heart. This was where NJW, the Nashville Jazz Workshop, needed to be. Roger couldn’t yet see past the mess, but I could. The strangest part was that by the time we ended our tour, Stephen and I were so excited about our possibilites of relocating to Neuhoff we were hugging. I felt like I found a very close friend – from another life, no doubt. When I pulled away in the car, I told Roger, “This is it!” He thought I was crazy, but I knew it was the workshop’s next home. Not long after that, my parents came to town, so I took them to see the Neuhoff site. The property needed so much work that they were concerned that may I have over-challenged myself! I also took a handful of our students over, just to see their reaction. While some of them thought I was crazy, others were very excited. For the next few weeks, I kept in touch with Stephen. At this point, we had to sever ties with the partnership we had with The Nashville Percussion Institute. It was tough, but we were ready to take the plunge. We left the institute on December 15, 2000, still trying to figure it all out. 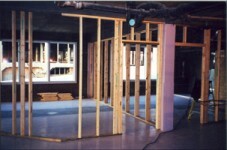 Who would build out our space? Where would we get the money? When would it be done? Could we do what we dreamed of doing? How? Within a few weeks of our initial visit, all those questions were answered. Our old neighbor, Richard Peden, of Albion Cellars, inspected the site for ways to build out the facility. At one point, I turned to Richard and saw a big smile on his face. He said, “I think you should let me build this.” We were so excited. We knew Richard would build something beautiful for us. But what about money? 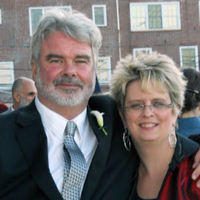 Roger called his sister and brother-in-law, Andrea and Dennis Lambert, to ask if we could borrow some money from them. When we laid out our business plan, they said yes. My parents were able to loan us money too. Then the “how” came into play: Our current development director, Larry Seeman, told us, “Let me write your grants.” To do that, we had to become a non-profit organization, which we knew would be a lot of work but would bring a lot of benefits as well. So again, we jumped off the cliff. We told Stephen we were ready to go. 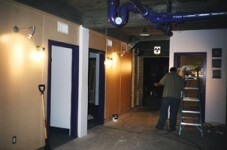 Richard drew up the plans, and on January 1st, 2001, construction began. One of the many wonderful gifts Stephen gave us was providing an alternate space free of charge so we could continue our classes until our new space was ready. So during the daytime, Roger and I would do what we could to help Richard – stuffing insulation, painting, cleaning, whatever he needed – and at night, we taught our classes in the front pink building. At that point, we had only two classes a night, totaling eight classes a week, and all of us enjoyed watching the daily improvements to the site. When the construction was almost finished, we had a painting party. Tony Kerr was our team leader and gave us all different jobs, and we were able to get almost all the painting done. Among our volunteers were Larry Seeman, Louise Barnes, Graham Gerdeman, Annie Sellick, Elyse Adler, Liz Johnson, Jody Faison, Jerry Navarro, Denis Solee and Rebecca Sayre. (Pardon me if I have forgotten anyone!) Soon after that, the carpet was installed. Then we moved in the furniture. It was so much fun to plan our big dream and see it come true. One interesting thing: We were a little afraid to take the performance venue space (later dubbed the “Jazz Cave”) in addition to the classrooms because we weren’t sure we could afford it. But Stephen insisted that it would be okay and encouraged us not to worry. Of course, he was right. 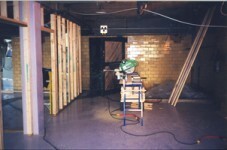 Richard took the initiative to build a kitchen into the performance room right away. 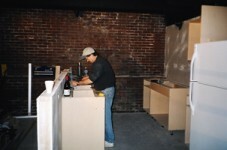 We were amazed that it took Richard only three months to build out the entire space. So we had our Grand Opening on March 24th, 2001. It was an amazing day of celebration with our friends and colleagues in our brand new space! It’s hard to believe we’ve been at the Neuhoff for fourteen years. 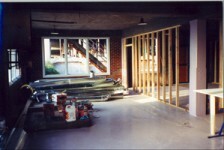 When we moved to the new space, little did we know how large the Nashville Jazz Workshop would become. As we grew, so many wonderful things happened, such as the “Master Series,” held on Sunday afternoons featuring local jazz artists. We later derived our “Jazz on the Move” and “Snap on 2 and 4″ programs from this series. Seeing how desperately Nashville needed live jazz, we began fixing up our own Jazz Cave. Again, our angel Stephen McRedmond stepped in. He bought all the tables and chairs for the Cave and then got his friend Cyndi Williams, an art designer, to paint the Cave. Jeff Hall, Tom Knox, and Mark Stanford came up with a sound system, and Mark and Laina Stanford put up our stage lighting. It certainly took a village to make everything work, and it still does. So thank you to everyone who helps make the Nashville Jazz Workshop a world-class education and performance center in Germantown. Happy Birthday, NJW! What’s your story? 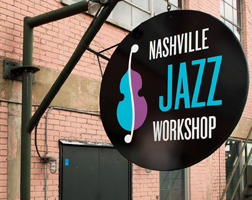 How did you discover the Nashville Jazz Workshop? My good friend, pianist Mark Sorrells, told me about the Nashville Jazz Workshop in 2003. He said, “They would love you out there.” So I took my first class in 2004. He was right! I have found alot of love at NJW, and renewed vision for my music. Loved singing and freshening up my chops there… That Halloween party as we came as song titles.. Well.. Too fun!! Tidbits on the making of The GEM; Lori Mechem. #6 Fantastic musician & friend to all!